This Malaysian eatery has been around for many years in Sydney. 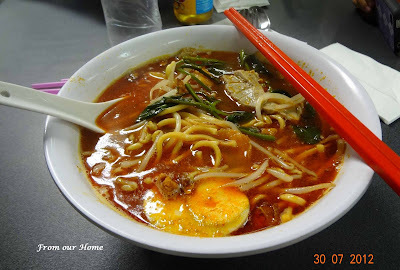 It is often considered the benchmark for its curry laksa and har mee (prawn mee). I have tasted quite a few bowls of Har Mee at the different Malaysian restaurants in Sydney, by far this is my favourite place for a Har Mee fix. On a cold wintery Saturday morning, slurping down a bowl of Har Mee really hit the spot for Chris and I. The mouth-watering soup had a good balance of prawn and pork stock. The noodles was served with topped with fried lard (che yau char), pork slices, fish cake, kangkung (water spinach), bean sprouts and half a boiled egg. I love the boiled egg served with the noodles, and will usually eat that last. The sambal which is an optional accompaniment is also full of flavour with belacan (shrimp paste) and dried shrimp. 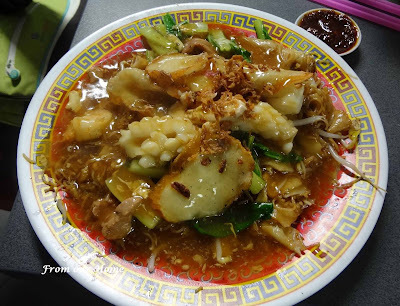 Our girls shared a plate of Combination Hor Fun (Wet Koay Teow), stir-fried rice noodles and rice vermicelli (yin yong) with a thick eggy brown gravy and seafood. Note: we bought a Singapore noodle as take-away for my parents. They both loved it, there was good 'wok hei'.